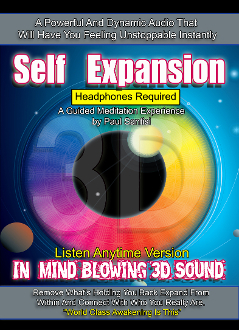 The name of this meditation is “Self Expansion” and the intention behind it is this. For the listener to feel better about themselves. To have a bigger smile on their face. To have more confidence, knowingness, success in their life and to embrace infinite love to rush into your life at record speed! Instantaneously is a more accurate descriptive word. I recorded thousands of pure positive feel good affirmations all in 3d sound, combined with some music that is simply fantastic. I also added in some theta brainwaves to assist in the mental creative process that will assist you in having new cognitions, realizations and a-ha moments that will instantly change and raise your overall energetic vibration and release within you pure magic that will flow through you and have positive impact not only on others but the entire planet as well.